Queen Letizia of Spain today received two audiences at the Royal Palace of Zarzuela in Madrid. First she met the National Women’s U-17 Soccer Team and later in the day received a representation from the Association for the Prevention, Reintegration and Attention of Prostituted Women (APRAMP). 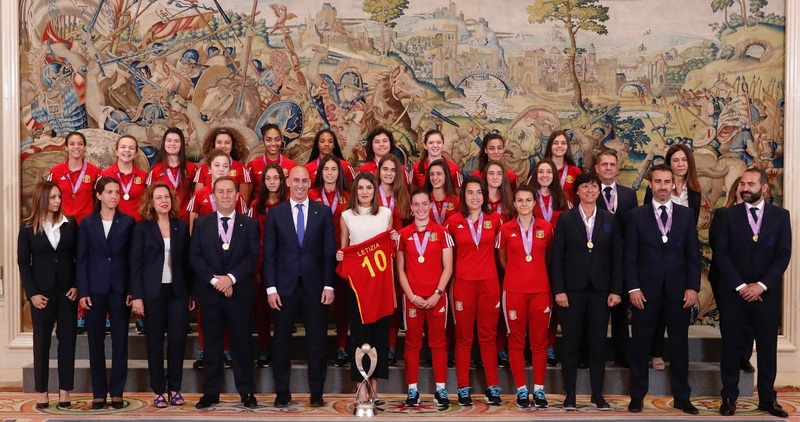 The National Women’s U-17 Soccer Team won the European Championship 2018 by beating Germany with 2-0 in May. Queen Letizia congratulated the team on its great achievement. The team was accompanied by the president of the RFEF, Luis M. Rubiales and by the vice president of the RFEF and president of the National Committee of Women’s Soccer, Rafael del Amo. The President of the Committee presented Queen with a team t-shirt in red color having her name on it with number 10. The players of the team clicked a group selfie with Queen at the Palace. Leter in the day The Spanish Queen met with the members of Association for the Prevention, Reintegration and Attention of Prostituted Women (APRAMP). APRAMP is a non-profit, non-denominational and non-partisan association focuses its efforts on combating trafficking of women from a human rights and gender perspective. The goal of the Association for the Prevention, Reintegration and Attention to Prostituted Women (APRAMP) is to prevent sexual exploitation and trafficking as well as to support the women suffered and exploited sexually by providing them resources to start a new life. For today’s audiences Queen Letizia wore a very simple outfit. She debuts a new white blouse that has box collar with a draping style on the front. The unknown white blouse is another new addition to Queen’s already huge collection of white tops and blouses. 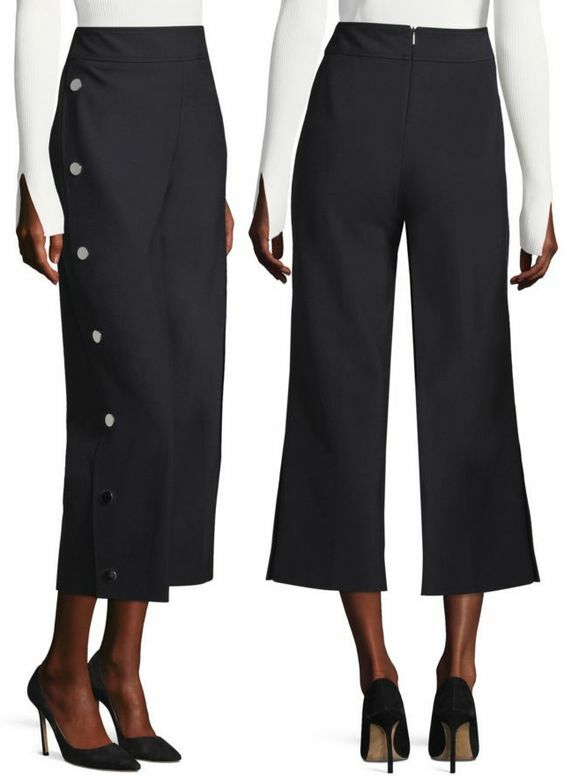 Letizia paired the white top with navy Hugo Boss wide pants with button detailing on the side that she debuted on the Easter Mass this year. Since then Letizia has paired the outfit with different styles many times. For the footwear, once again Queen chose her trusty label Magrit. She was wearing blue and white bi-colour leather Salons from Magrit that she first wore this year during Student Resident Meeting. Her TOUS freshwater cultured pearl and Diamond White Gold earrings, she also wore on Tuesday while launching African Women Foundation Project, finished her simple look of the day.